The Harrow stirs up and smoothes the soil that has been left in chunks by the plow. Its disks can stir up the soil to the depth needed for planting. This Disk Harrow was made after 1910. It was pulled by horses. By the 1930s, when tractors replaced horses, harrows with larger disks replaced the plow. The plow leaves the earth in large clumps. Seeds need to be planted in level ground with about 2 to 4 inches of soft earth. A method for leveling the ground and has been around since the beginning of farming. Initially it would nave been a tree trunk. The Roman harrow consisted of a plank with iron spikes protruding through its bottom. The spikes leveled the ground and broke up the soil. The all metal harrow with clamped on metal teeth was introduced in the early 1800s. Spring tooth harrows came on the market in 1877. Disk harrows in the 1880's. 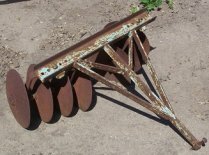 The disk harrow is used to stir the ground to a considerable depth. It can be adapted to a variety of conditions. The disks may be of the solid or of the cutaway type. The factors which influence the depth to which a disk harrow will penetrate are 1. The angle of the disks, 2. The weight of the harrow, 3. The sharpness of the desks, 4. The size of the disks, 5. The dish of the disks, and 6. The angle of the hitch. The first three are the most important, and all are within the control of the operator. As tractors replaced horses in the 1930s the disks became larger and were able to replace the plow. This disk harrow is of a modern make after the 1910 as can be seen by the welding. The angle of the disks to the direction of pull is adjustable.